Cro-Magnon people began migrating into Europe 45,000 years ago when the climate was relatively mild, with lush grasslands supporting large herds of game. Around 41,000 years ago, however, temperaturesdropped precipitously to averages of -13 F in winter and 50 F in summer. The ground was frozen for much of the year and vegetation became tundra-steppe, giving rise to animals like bison, mammoths and bears that were acclimated to the cold. While our ancestors were able to adapt and survive, and the climate continued to fluctuate, temperatures never reached today’s levels. Around 24,000 years ago, temperatures again dropped dramatically as ice sheets and mountain glaciers expanded to make Central Europe uninhabitable, forcing the Cro-Magnon people south. Western and Southern Europe became polar deserts with minimal forestation. Glacial ice was up to 2.5 miles thick and sea levels dropped 390 feet below the present day. 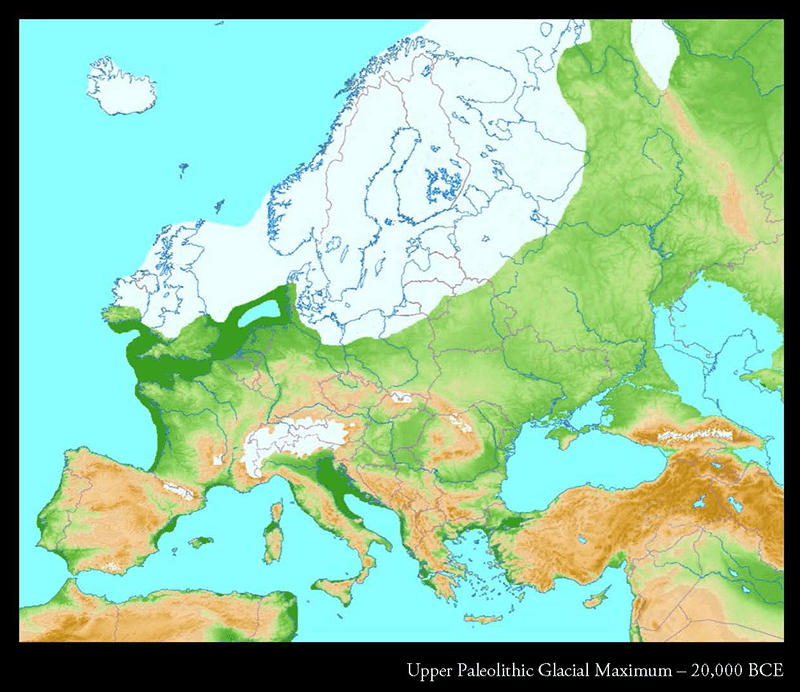 The map on the opposite page shows the extent of glaciation at 20,000 BCE.